For the last eleven years, Volume One has turned to its readers to vote for their local favorites. From yummy places to eat to emerging bands to trusted tax services, the community of Chippewa Valley weighs in on the best of the best. 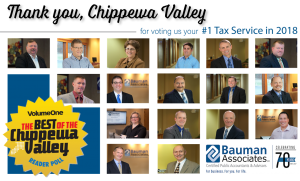 Bauman Associates is honored to make Chippewa Valley’s Best Of list in 2018. Click to learn more about our Tax Services.